This past weekend, I took a much needed break from Boston and took the train to Manchester-by-the-Sea with my friend Shawn. When we arrived, we immediately sought out a good place to eat. After some deliberation, we ended up at a great spot called Superfine. I don't have any shots of the meal but it was delicious! I had the fish burger and Shawn ordered a vegetarian reuben sandwich. After eating, our waiter pointed us in the direction of Singing Beach. This is one of the few beaches in the world that has singing sand that basically produces a sound when you walk on it. There are very specific conditions that have to be met for this to happen (see the wikipedia link). We ended up spending most of the day on the beach since it was so beautiful there. As evening approached, we headed back towards the train station but not before briefly stopping for ice cream and sorbet at Captain Dusty's! A boozy brunch in upstate NY was the perfect way to end summer. Last weekend, I found myself outside of Cooperstown in a restored barn on a Sunday. The morning light was so beautiful and the food was even better! Below I've linked a few photos from the event so you can get a sense of the place. This past weekend I was in Montréal coincidentally at the same time as the Canadian Open. I don't know anything about sports but somehow ended up looking like I was going to play tennis on Sunday afternoon - as per usual armed with a cup of iced coffee. This summer I have unexpectedly been really into patterns, one of which is gingham. 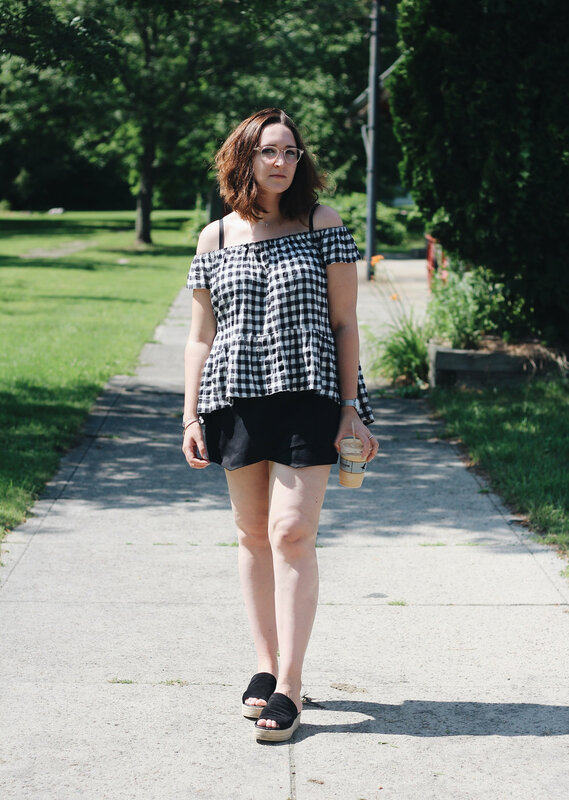 See below for how I styled it this weekend (featuring me frowning and holding another beverage but this time it's coffee aka the love of my life). Top is from & Other Stories, skort is from GAP, shoes are from Vince, oval bracelet is from COS, rings are from Madewell, glasses are from Ace & Tate, hoop earrings are from Free People. Started off yesterday with a slow morning filled with iced coffee and Kinfolk magazine. Around 3 pm, I headed downtown to meet my brother at Pier 11. From there we caught a ferry to Red Hook, Brooklyn! While walking around the neighborhood, we came across Cacao Prieto, a chocolate maker and liquor distillery that's in a beautiful old brick building. All of their cacoa is sourced from the Dominican Republic and then refined into products there. They offer tastings and tours of the factory that you can book online! It's definitely worth a visit just to check out the enormous space. More walking led to the discovery of a shop that exclusively makes key lime pie. I didn't have a chance to try anything but I'm definitely going back! Above I am wearing a Selected Femme tee, Vince Camuto trousers, Komono sunglasses and Sacha boots. You can find similar chain bags in a variety of colors via the designer Stella McCartney. After walking through Red Hook, we went to an event at Pioneer Works, an arts organization located in what used to be a factory for constructing large scale industrial machines. On the second Sunday of every month, they host open studios with current artists that are doing residencies there. There is also usually a concert and an array of different foods/drinks. I didn't get a lot of great photos inside of the building since the light was a bit low but above is a shot of one of the gorgeous workspaces. The last stop of the day was a bar called Botanica, located right next door to Cacoa Prieto. They have some incredible cocktails listed on the menu. A lot of the specialties are based around rum and whiskey. After much deliberation, I settled for the "Gin Gin Mule" which contained ginger peppercorns and lots of mint. Very refreshing after a hot day! p.s. this post was not sponsored by Juice Generation but I would love to be sponsored by Juice Generation. If anyone has any Juice Generation connects, hit me up. Maybe it's ridiculous to pose with a smoothie but Ebrima said that the straw matched my pants so I had to hold it for the photographs. A brief guide to Amsterdam food and drink. If you're anything like me then you live for breakfast. When my mom came to visit me abroad, she stayed at the Pulitzer Hotel. This was by far one of the nicer hotels that I have seen. It has huge skylights that let in a lot of natural light as well as a beautiful outdoor garden. It's an eclectic mix of traditional Dutch design with more contemporary design pieces. It also happens to have a great breakfast menu. Usually my mom can't eat a lot of regular breakfast stuff like waffles because she's gluten free. This is often a downer because eggs benedict is one of our mutually favorite foods. We were pleasantly surprised to find out that rather than serving the egg and smoked salmon on top of an english muffin, the Pulitzer served it on a hash brown. It was a little heavy on the hollandaise sauce but still delicious! During my time in the Netherlands, I went on a lot of day trips to cities outside of Amsterdam. I frequently found myself under-caffeinated before catching a train from Amsterdam Centraal. In my search for coffee, I found Mr. Sister which ended up becoming one of my favorite cafés. The building itself is situated behind the station right on the water. It has a spectacular view of Amsterdam-Noord and the EYE Film Museum. There's outdoor seating in the summer but I would suggest sitting inside in the back room with the panoramic windows. The room gets a ton of natural light and it's fun to watch boats drive by. The sandwiches here are pretty good and the coffee is great. The only thing I would warn about is the service. Every time I went, it was pretty slow. So if you're in a rush, it's probably better to grab coffee to-go somewhere else inside of the actual station. This has been rated one of the best places for brunch in Amsterdam and for a good reason! I ate here multiple times because the food was so great. Bakers & Roasters was started by two guys, one from New Zealand and one from Brazil. As a result, the menu is an interesting mix of classic brunch dishes with some interesting things thrown into the mix. Not only that but the atmosphere here is great too. The staff are super friendly and helpful. Bakers & Roasters has two locations; one is in De Pijp and one is more north-east on Kadijksplein. The De Pijp location gets super packed, even on weekdays, so definitely expect a decent wait before you are seated. The Kadijksplein location also gets busy but not as bad as the De Pijp one. It's a little smaller but they have a ton of outdoor seating in the summer. My favorite dish here is by far the huevos rancheros. It's served on a crunchy tortilla and piled with tons of different salsas and sauces. Also pictured below is the acai bowl which is a great way to start your morning off if you're craving fruit. This hotel is located right next to the Amstel river. It has incredibly views of the water which is what drew me to it in the first place. Be warned, it is quite expensive. I probably wouldn't eat here regularly since it's pricey but it's a beautiful place to get a before-dinner drink. They have a huge patio with comfy wicker chairs under umbrellas. Like Mr. Sister, it's fun to watch all the boats go past the hotel. The drink menu itself is actually pretty interesting. They have monthly cocktails and signature cocktails that are named after different the different parts of the city. They use all sorts of different flavors like smoked rooibos, thyme, elderflower and maple syrup to name a few. When I went here, I stupidly stuck to the basics and ordered my favorite drink, an aperol spritz, rather than something special. It still was pretty good but when I go back, I will definitely order a more unique cocktail. Last but not least, this distillery is one of my favorite spots that's hidden away in Amsterdam. It's in the middle of Flevopark, which is between Amsterdam-oost and the Eastern Docklands. The building is a quaint little white house that's right next to a large pond. It has tiered seating that feels almost reminiscent of the Italian countryside. The distillery carries some beers, ciders and wines but the highlight of their drink menu is the huge selection of liquors that they make themselves. Their particular specialty is jenever, a Dutch liquor that is similar to gin. They make a lot of different flavors like lemon, raspberry and vanilla to name a few. The straight jenever is very strong but the likeurtjes (liqueurs) are more sweet. When I went, I had no idea what to order. The bartender was so kind and let me sample a variety of different flavors before I decided on a raspberry liqueur. It was incredibly rich but amazingly unique! Musings about where I’ve been, what I’m doing, and where I’m going.